Because breakfast is my favorite meal of the day (Coffee and a sweet? What's not to like?) I have go-to bakeries in every city I visit. In San Francisco, it's Tartine for a morning bun. When I go to Boston, there's no doubt I'm stopping at Flour to peruse my options. So it's no surprise that I'm eagerly awaiting these new fall cookbooks. Even though I'll probably never cook from either (let's face facts) I'll still devour the pictures and narratives and dream of when I can return. For more peeks at the new Tartine Bread book, visit tartinebread.com. Thanks for the tips. 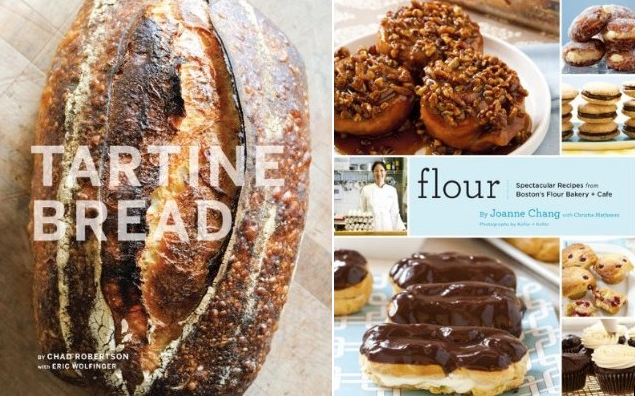 We love to discover new baking books. Our favourite is The Bread Bible by Rose Levey Bernabaum - fab book, perfect bread every time. Highly recommend it. Yum! I wish I could bake, but I hate to measure! Cooking is more my speed, but I will pass this book along to a friend. when in boston(brookline) you have to go to http://www.tattecookies.com/ you will love it ! Until very recently, my office was located across the street from Flour, and being the dessert addict that I am, I went there almost everyday. I highly recommend their chocolate cupcake and raspberry seltzer. Everything there is simply delicious! I have a baking obsession. There's nothing better than eating something you made - fresh from the oven. Also, this post is making me want an eclair - right now. um, kind of off-topic but maybe you know... what is that delicious typeface they've used for the word "flour"...? I totally know what you mean! I think the reason I love going to bakeries so much (vs. baking myself) is that I know it'll taste better than anything I can make. :) If you're ever in Seattle, hit up Macrina, it's simply amazing. they really know how to take a good photo of baked goods! how tempting. I got "Baking with Julia" from the NPR drive last year, and I still haven't used it, but admire the photos. Yes, you should indeed come visit! The new location in Cambridge is a block away from my place (I'm an MIT grad student) - and it's just addictive. Yum. When I lived in Boston, i frequently toted my toddler down to Flour. Its simply delicious! Interesting story behind its making...the owner and pastry chef used to work for IBM (I believe) before deciding to pursue her dreams. I've always found this bold move very inspiring! I love breakfast so I will note the one in boston as we have friends there. Mmmmm, Tartine. I'm so glad I don't live closer- I'd be much fatter, though probably very cheerful about it!